Fearing that his encounter with Esau may be a hostile one, Jacob appropriated a considerable gift for Esau from his flocks. Then, Jacob sent his gift ahead with some of his servants to meet Esau first while Jacob and his immediate family remained behind. Finally, Jacob took his immediate family with him and headed out to meet Esau. On the night before his meeting with Esau, Jacob was alone and during the night a man wrestled with him until daybreak. While they wrestled, the man touched Jacob’s hip and dislocated it. But even with a dislocated hip Jacob continued to wrestle with him. Jacob would not let go. The man, of course, was God Himself in the form of a theophany or angelic being. And Jacob held on insisting that He bless him. So God changed Jacob’s name to “Israel,” which means “struggles with God” and reaffirmed His covenant with Jacob, now Israel. From Jacob’s descendants came the nation of Israel, God’s chosen people, whose history as recorded in the Old Testament is one of struggling and striving with God. Striving with God is Israel’s story. And Israel’s story is our story. In fact, it’s the story of our human existence. We human beings struggle and strive with God. We wrestle with God for control of our individual and collective lives, it’s the strife of life. It’s what we do! Problems we bring upon ourselves as consequences of our own bad decisions, sinfulness, and/or willfulness (disobedience). Probably, the second and third categories could be bundled with the first category (or the first and second rolled into the third) because they are all the result of our struggle with God, a struggle that God will actually use to bless us just as He did with Jacob. And problems, no matter what caused them, can have the effect of pushing us toward God! And blessing, God’s blessing, comes when by God’s empowerment we emerge victorious from the struggle. 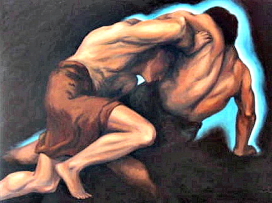 So, whatever the category of problems that confront us as a result of this human/divine wrestling match, hopefully, like Jacob of old, we will take hold of God and not let go so that our struggle with God becomes our struggle for God! This entry was posted in problem-solving, problems, rebellion, suffering and tagged Bible, problems, suffering. Bookmark the permalink.